I've seen every tour of U2 since their 1989 "When Love Comes To Town" tour and have all their albums so maybe I can be considered a fan. 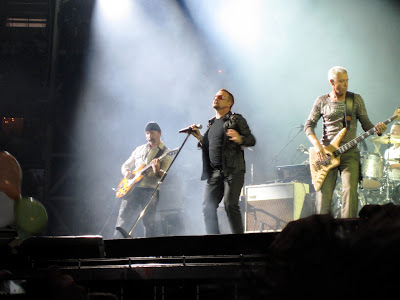 Although I have to admit their last meaningful album was "Achtung Baby" it's always a big thing when they play live. And of course the "360° Tour" was no exception. It seems aliens have taken the Amsterdam Arena when we enter the stadium. What seems to be a space ship is the stage for the evening. Four long legs stretch out to the side of the stage and a big round screen is hanging above it. When Snow Patrol is warming us up it gives us a sneak preview of what we can expect from the screen. Visuals and footage of the stage are shown al the way around on it. Gary Lightbody and co do a pretty good job and play all their hits. They leave quite a good impression I think and are definitely one of the best support acts I've seen. Of course the sound is pretty horrible which is no surprise in this awful sounding stadium. When Bowie's "Space Oditty" sounds loud across the stadium and the lights go out it means it's show time! I expected a loud and rocking opening song but instead U2 decides to play "Breath" as a first song. Followed by "No Line On the Horizon" they're off to a slow start. When they play "Get On Your Boots", the worst song of their new album but live slightly better, the crowd starts to live up. But then the U2 train is starting to run high speed and the fire is lit when hit after hit follow each other. Two bridges connect the outer stage with the inner stage and especially The Edge and Adam Clayton use it a lot. Bass player Clayton looks very relaxed and seems to enjoy himself a lot. Singer Bono also makes it across now and then but seems less active then in the past. It's definitely clear that time has taken a grip of the band. Besides only showing footage of the stage and supporting visuals the screen has a nice surprise up its sleeves. At one point it unfolds into many smaller particles which gives it a very surreal appearance. Now and then Larry Mullen Jr.'s drum stage turns around and the band face the back of the stage but most of the time these people only see the back of them. There's some room for social criticism as expected but it's not annoying like we've seen before. Archbishop Tutu makes a guest appearance on the screen as do the crew of the international space station MIR. One of the surprises in the set list are "The Unforgettable Fire" and one of the encores "Ultraviolet" that they haven't played live in a long time. Also there's a short version of "MLK" that doesn't sound as good as the original and shows that Bono's voice has trouble with reaching the high registers. They decide to end the show as it started with slow songs "With or Without You" and "Moment of Surrender". In that last song Bono also sings part of "40" but he only sings a few lines of it. Despite the big screen and impressive stage this time they all support the band instead of taking the spot light like in previous tours. 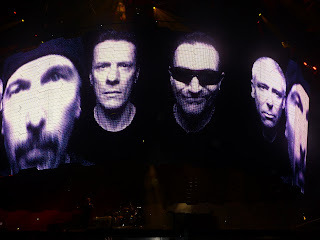 And it shows that U2 is still capable of a very good live performance sounding like a tight playing band. Even though they are sometimes wide apart on the big stage they still keep contact with each other meeting one another in the middle several times. 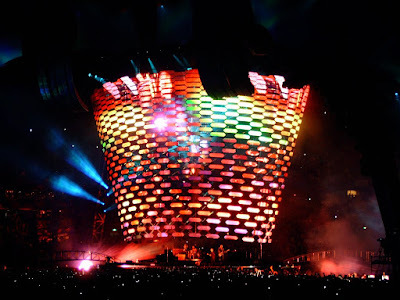 Bono mentioned early in the show they would try to shrink the stage. Especially in the strong hits of the past they manage to do exactly that and turn the big stadium performance into a small intimate gig.